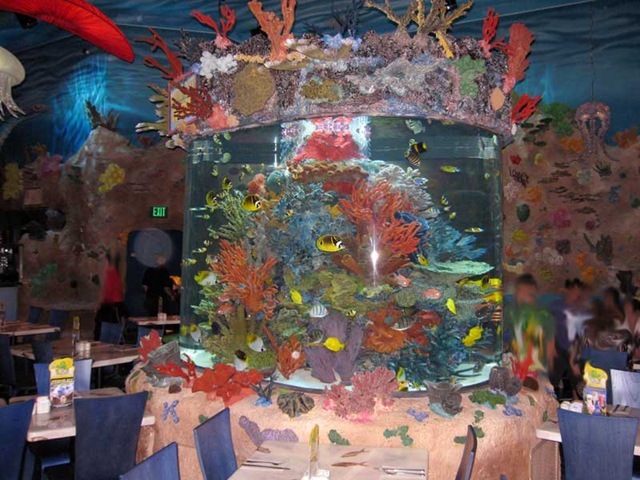 The restaurant is owned by Landry’s Restaurants, owner of a number of specialty chains. 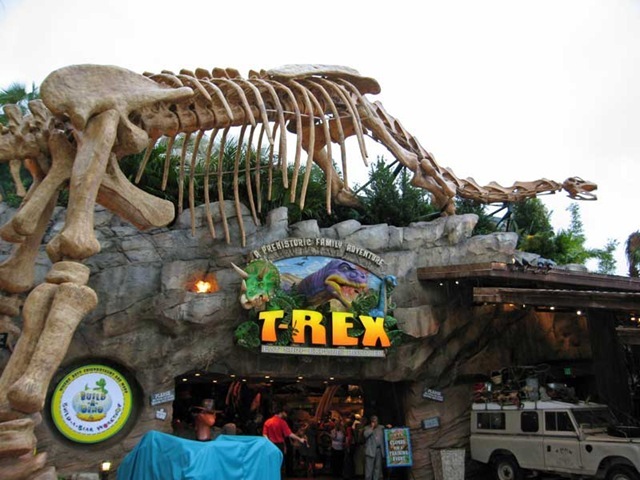 In fact, the Downtown Disney location is actually their second T-Rex Cafe, with the first one having opened in Kansas City almost a year earlier. 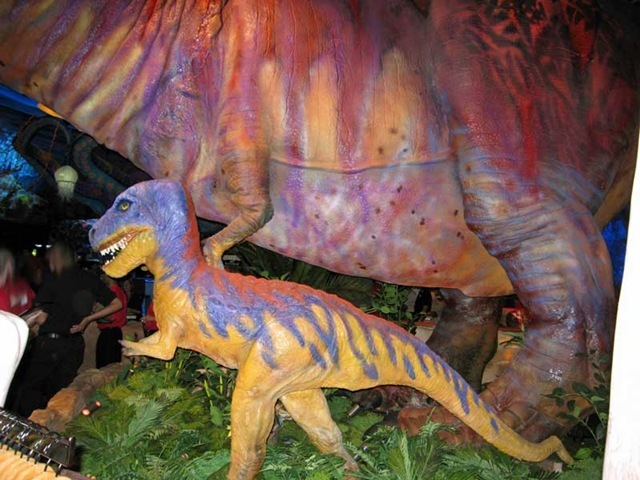 The largest and best known of their chains is Rainforest Cafe and T-Rex is actually somewhat similar both in its menu and the overall atmosphere. 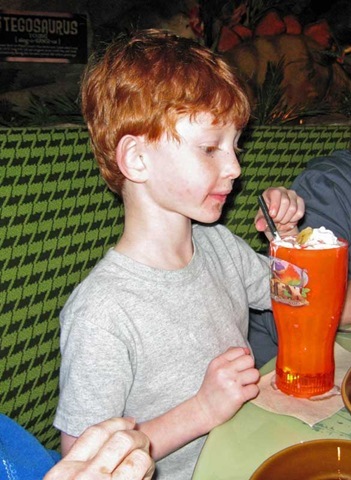 Having dined at the Rainforest Cafe location at the Disneyland Resort on several occasions (we’ve actually never been to either of their locations at Walt Disney World), we did have a pretty good idea of what to expect. 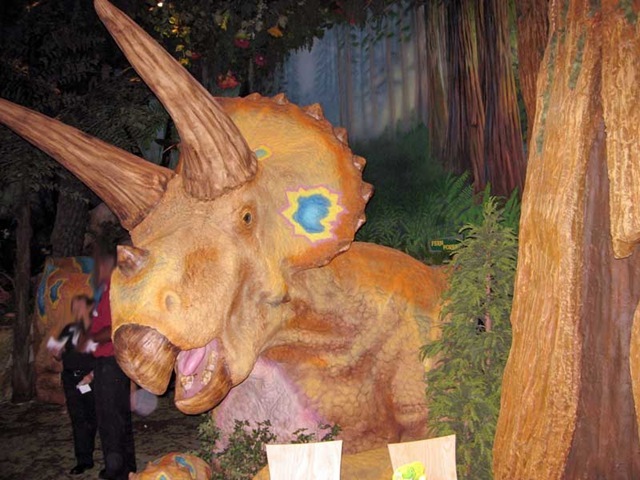 As with Rainforest Cafe, the elaborate theme and decoration is the main reason for a visit. 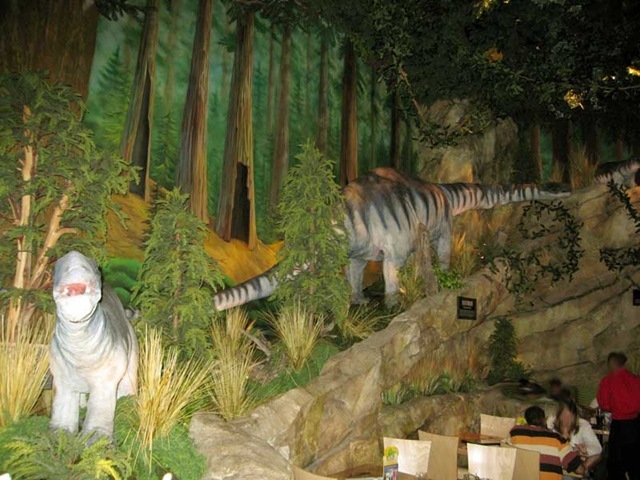 As the name suggests, the restaurant is decorated with a variety of prehistoric tableaus, including quite a few animatronic dinosaurs. It is pretty hard to do the restaurant justice in text, so I’m going to let the photos do the majority of the talking here. 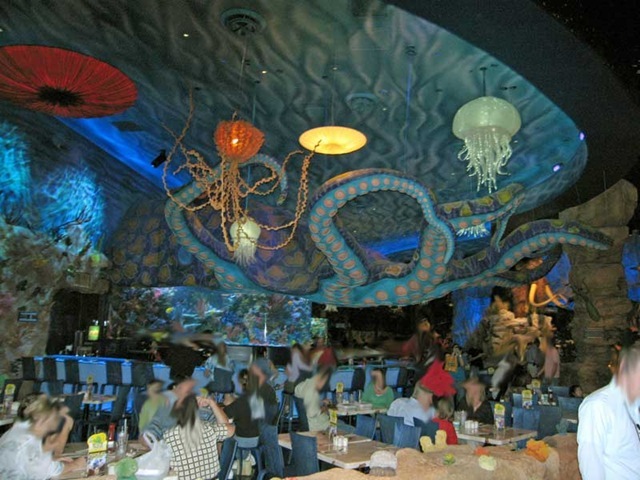 The restaurant really is rather impressive in person and I definitely think that they have taken the theme a few notches beyond Rainforest Cafe. 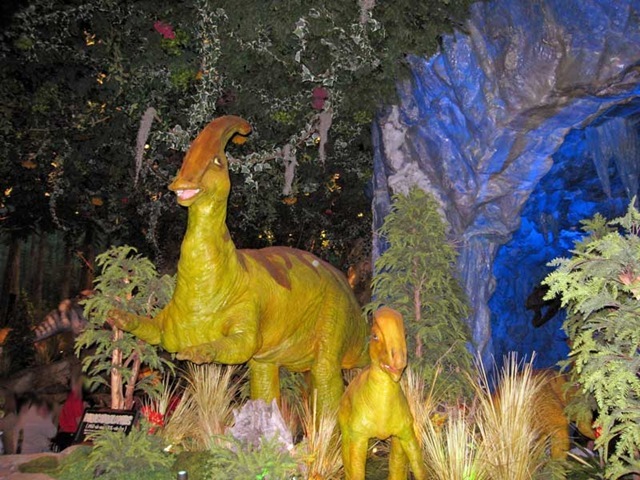 Every once in a while, the lights dim and various lighting and sound effects are used to simulate a meteor shower taking place (this is similar to the occasional thunderstorms at Rainforest Cafe). 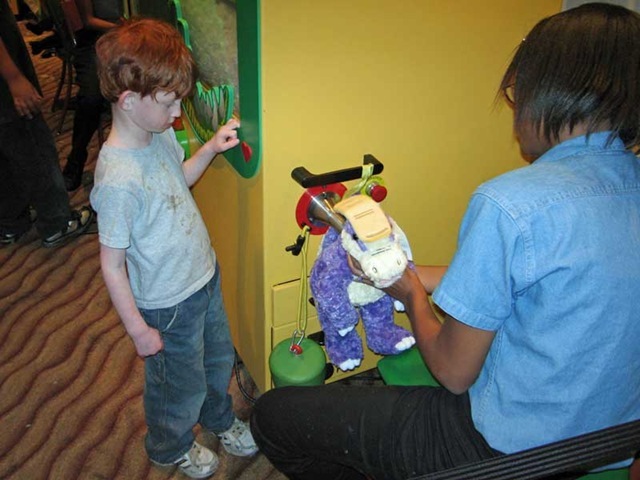 The animatronics are all programmed to become very agitated and go into lots of motion while this happens. It is kind of silly, but also a bit amusing. I did think they did this perhaps a bit too often, though. It happened several times during our dinner and it got kind of old after the first couple. 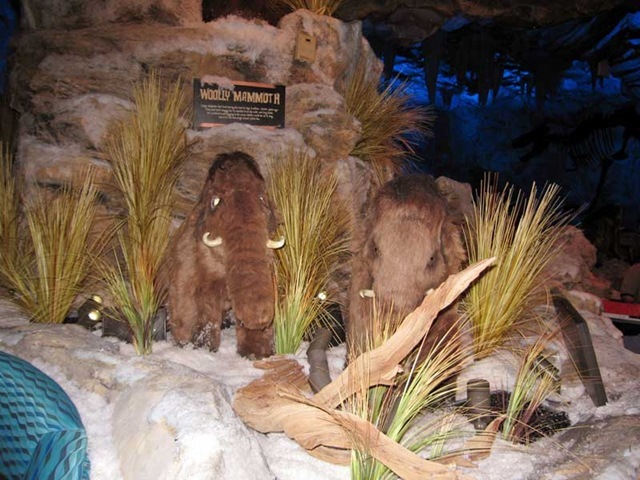 The main dining area includes a couple different themed areas, including one room with a sea theme (including a large fish tank, somewhat similar to the ones found at most Rainforest Cafes) and another area that is designed to look like a large ice cave. In the sea themed area, I particularly liked the lights that were designed to look like jellyfish. The food is generally adequate, if a bit overpriced, but it definitely isn’t a fine dining location. The majority of the menu items are essentially fairly typical family-targeted diner items such as burgers and other sandwiches as well as a few pasta dishes and lower-end seafood and meat entrees. As a starter, the waiter recommended the "Colosso Nachos", which we went ahead and ordered. This is an absolutely huge appetizer that was pretty reasonably sized for our very hungry party of six, but probably would have been a bit too much for many people. I had the "Tar Pit Fried Shrimp", which was pretty good although perhaps a bit bland. The shrimp normally came with fries, but I saw that they had fresh-made potato chips offered with some entrees and I had them substitute those for me instead. I was pretty happy with that choice. My wife had the "Bronto Burger" with cheese and bacon and seemed happy with it. She actually asked for the chips as well, but they ended up bringing her fries instead and she didn’t care enough to go to the trouble to ask them to correct it. Our son ordered "Cosmos Cheesy Macaroni" off the children’s menu. I don’t recall for sure, but I think the others in our party all went with either the shrimp or the burger as well. My wife, son, and I all ordered specialty drinks in unusual souvenir containers that we could take home with us. The drink I ordered was basically a blue raspberry flavored Icee served in a tall plastic bone-shaped cup. It was pretty good, although the oddly shaped container actually made it a bit hard to get at the bottom part of the drink. My wife and son both ordered strawberry smoothies that were served in orange plastic glasses with lights in the bottom. 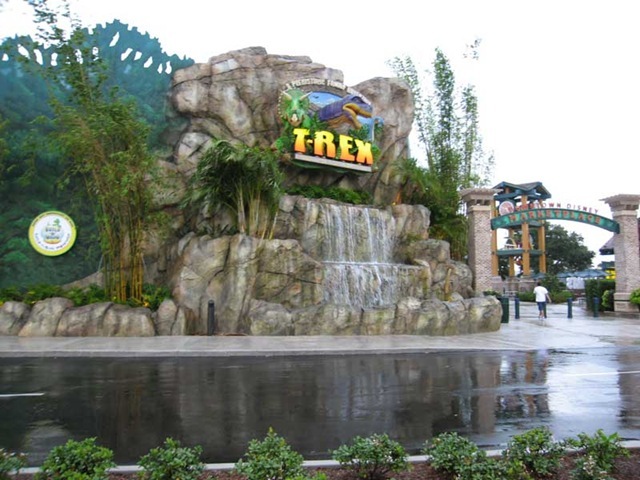 Of course, there is also a gift shop area where you can purchase all the expected T-Rex Cafe branded merchandise, including t-shirts, hats, plush dinosaurs, and other similar items. 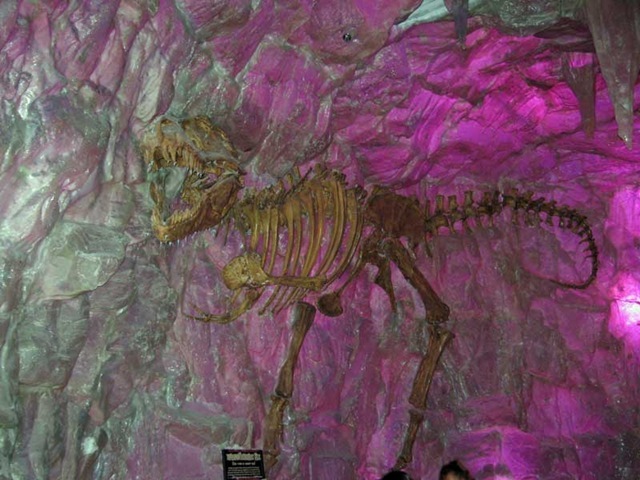 Right next to the gift shop area they also have a fossil dig area for kids to play in. 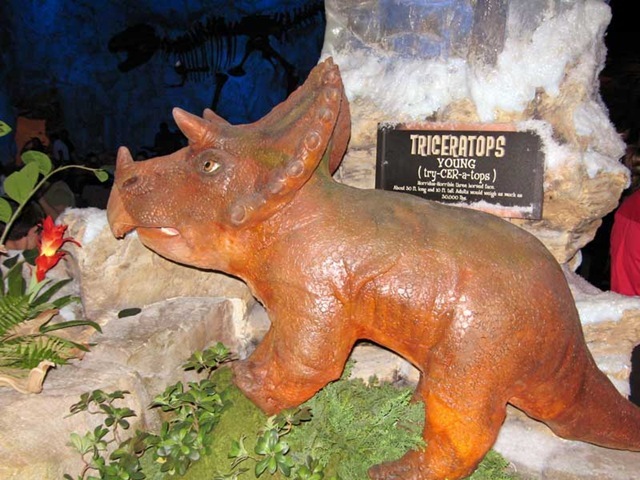 This is a good-sized sandbox with various fake dinosaur bones hidden under the sand. 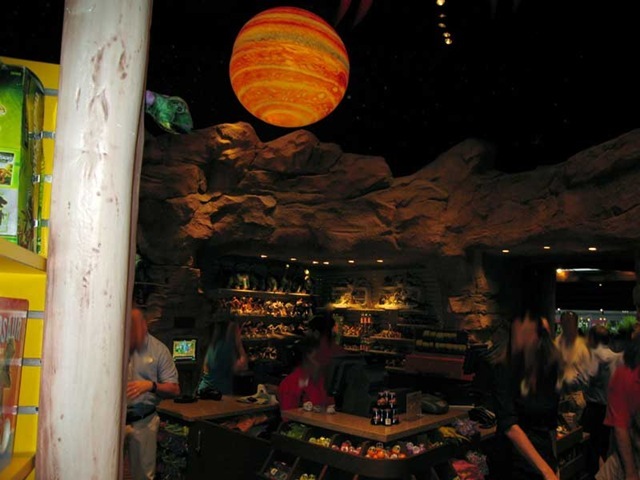 It is much smaller than the similar area in Disney’s Animal Kingdom, but still a fun diversion where kids could spend some time during the wait for a table or while parents are shopping. 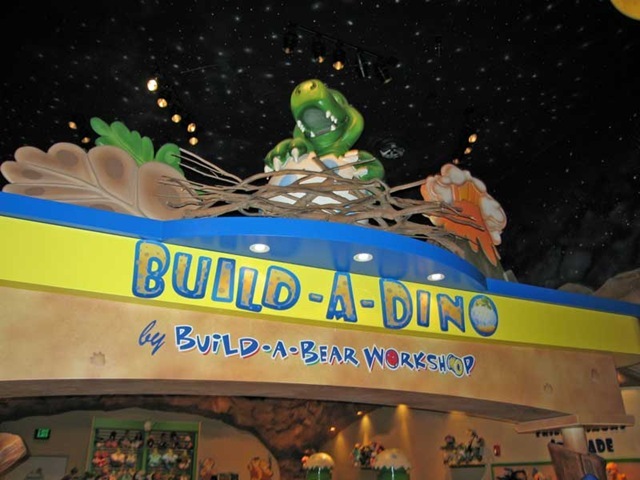 At the back of the gift-shop is "Build-A-Dino", which is run by the Build-A-Bear Workshop chain. 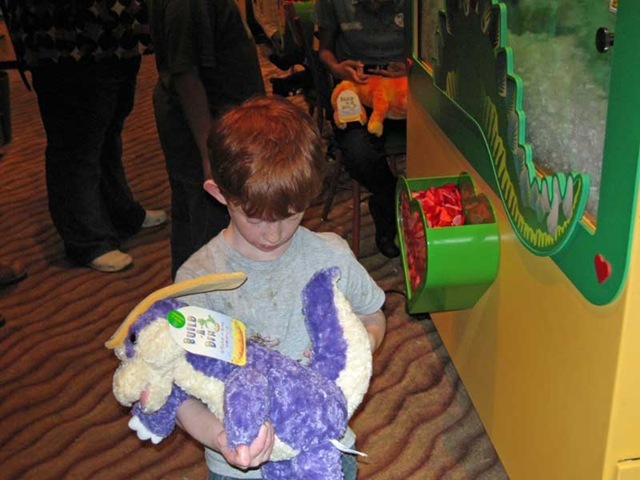 Like those stores, guests select an un-stuffed plush which employees then stuff for them using a special machine. The guest then sits down at a computer to select a name for their plush (and, of course, get on their email list…) and print out a birth certificate. The prices weren’t really that bad (only $20 for a fairly large plush), so we let our son get one. He seemed to have fun with it, although he was engaged in pretty serious concentration in the photos we took. 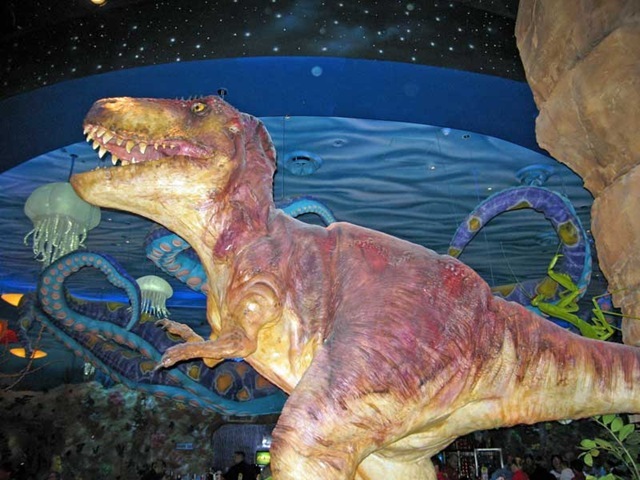 As far as themed restaurants of this type go, we thought this was a pretty good one. As is typical of this kind of place, you pay a bit extra for the theme compared to other restaurants with a comparable food selection and quality, but the theme here is well-done and the place is a lot of fun. 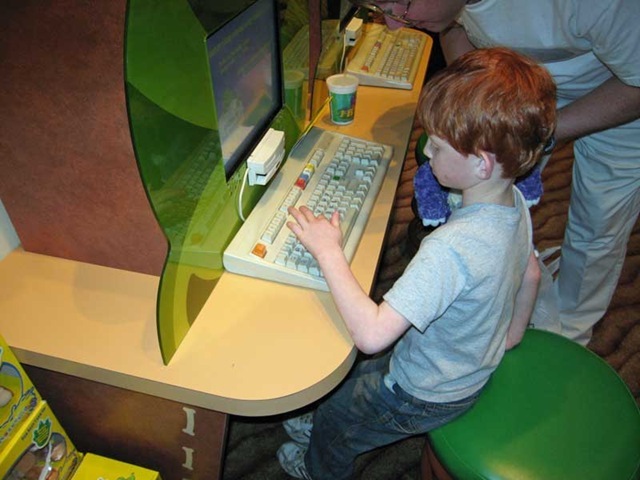 I think it is pretty likely that we will visit again on future trips to Walt Disney World. One of the things I don’t like about Rainforest is when the animals start making noises and stuff. It’s never happened to me, but I’d hate to be at one of the tables where the gorilla is RIGHT THERE and starts to go crazy. Are the tables that close to the dinosaurs as well? I think they’d be fun – at a distance. And taking into account that I’ve only been to Orlando’s Downtown Disney twice and have only a fair idea in my head of what’s where, where is the new restaurant located? Did it replace something else? I’m actually not sure if the building replaced anything else or not. From construction photos, it was constructed new (not converted from an existing building), so my guess is that it was built in a previously empty location. It is kind of towards the center of the whole Downtown Disney complex, pretty much right next door to the McDonalds. Don’t know if that helps, though, as I don’t really know the place exceptionally well myself. In fact, we had a hard time finding the restaurant even with my Dad calling out landmarks over the cell phone.